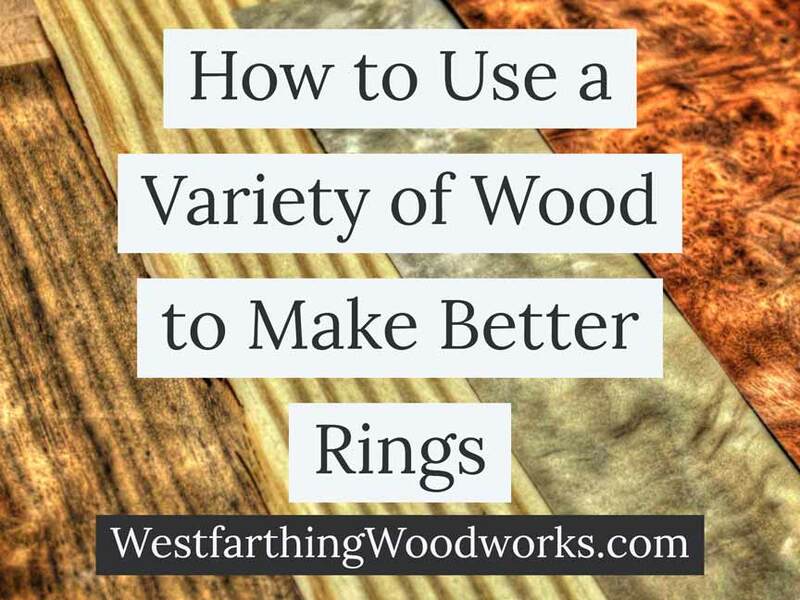 This is how to use a variety of wood to make better rings. As a ring maker, the number one way that you have to express your designs is through wood choice. When you use a variety of wood, it helps you show more designs and styles. Here is how. There is a lot of wood in the world. In fact, until you really take a look, you might not really understand how different wood can be. Did you know there is purple wood? Red wood? Even wood so heavy it doesn’t float? 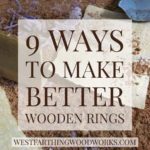 There are a lot of interesting things that you can do once you know more about wood, and making better wooden rings is just one of them. For a quick start, take a look at my 7 Beautiful Wood Species for Making Rings, which will quickly introduce you to some of the wood available in the world. 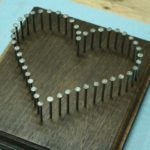 When you finish that, come back and I’ll show you how to use different types of wood to add variety to your wooden rings. It should go without saying that if you only have oak and poplar, the only designs you can showcase are going to be made from oak and poplar. While this might be fine in the beginning, as you are learning, eventually these colors are going to be boring. The more wood you have, the better you will be at capturing the looks that you are trying to capture in your work. This means not only the solid wood rings, but laminated rings as well, which you can learn more about in my post on Making Laminated Rings. As a new ring maker, the more wood you have in the shop, the better off you will be when it comes to making decisions about design. You will have more choices, and be able to show off more and better looks. Learning about new woods is easy. In fact, you have several great options and they will all teach you about new and interesting wood species. The first and the most obvious is where you are right now, the internet. 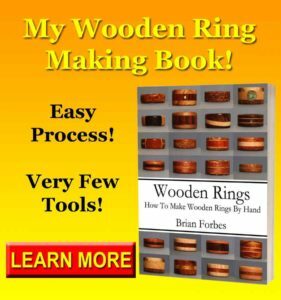 The internet is a huge resource for making wooden rings, and for learning about the different types of wood available in the world. Simply google search exotic wood, or rare wood, and you will find a lot to learn. It’s fun to look at the different types, and see what the world has to offer. Another great resource are books. You can find books in stores as well as online that show each type of wood, as well as properties associated with the wood. This is great for learning about new types, and finding things you didn’t know existed. My Ring Making Book is a good choice too. 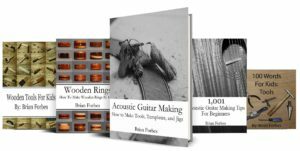 There are a lot of places to find new types of wood for making rings. 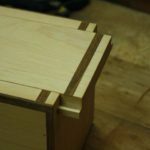 For finding out about new wood in general, and finding new places to get it, I wrote a post called 15 Great Places to get Woodworking Wood. This can help you open up a lot of great places that you might not have thought of. If you are brand new, the best place to get started is to go to a local wood store. If you do not have a wood store, then look online. 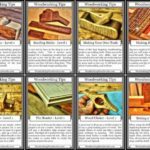 You can find a lot of great looking wood types just by looking in a couple places like this. If you don’t want to leave the house, try an online place. After you see a few things, try taking a trip to a local store. There is something nice about being able to handle the pieces before you buy them. Sometimes, a piece of wood just stands out when you get to actually handle it. 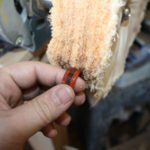 One secret way to find new wood for your wooden rings is to try looking in the scrap bin at your local woodworking store. This is a great place to find and use new types of wood without having to spend a lot, because the pieces are small. A scrap bin typically has smaller pieces, and those that were drop on the floor for some other project. Instead of throwing them out, the wood stores put them in a large bin and they sell them for as low as ten cents each. Next time you are in the wood store, see if they have a scrap bin. If they do, you can acquire several different types of wood that you can try out. The really nice thing about trying out wood from a scrap bin is that you can get a lot of different types of wood for a very low price. Try out some new types of wood. 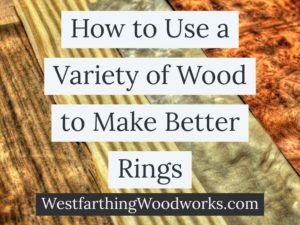 The best way to get more variety into your wooden rings is to add more types of wood to your shop. If you are only working with a few different types of wood, then you are missing out on a lot of looks. Unless you are commonly working with twenty or more types of wood, and even in a case like that, you are still missing out on so many different species. It’s just amazing how many different kinds of wood are in the world, and you will never know until you give them a try. Take a shot by going into a wood store, and buying some new types of wood. Select a few that you can get from a scrap bin, or pick some that are off the shelf. Bring them home, and try them out. Add them to your existing designs, and you will love what you are capable of making. Variety is the best way to increase the number and variety of rings that you have to offer. If you are stuck using only a few kinds of wood, then you are only going to be able to showcase a certain amount of styles. Instead of using the same kinds of wood over and over, try out some new types of wood. Go to a local wood store, or look online for some different species to try. When you get them home, try to incorporate them into your ring styles. When you find a few different kinds of wood that do well with your designs, keep on working with them. Every once in a while, go back into the store and try out a few more types. You might find more types of wood that you like.